24 countries. Over 25,000 miles. 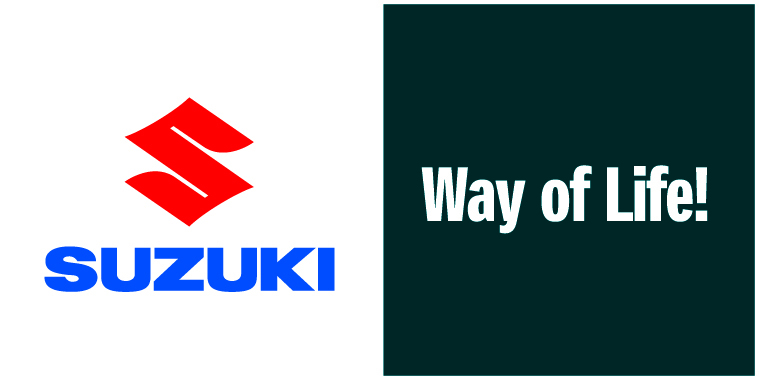 Commencing on the 21st April 2012, we, Peter Foulkes and Jon Brookbanks, will embark on an 8 month round-the-world motorcycle adventure in order to raise money for Cancer Research. Heading East, the first part of the journey will take us through Europe, Russia, and Mongolia, following a similar route to that taken by Ewan McGregor and Charley Boorman in the Long Way Round. From Ulaanbaatar we will then head North back into Russia and ride the Western half of the infamous BAM road. 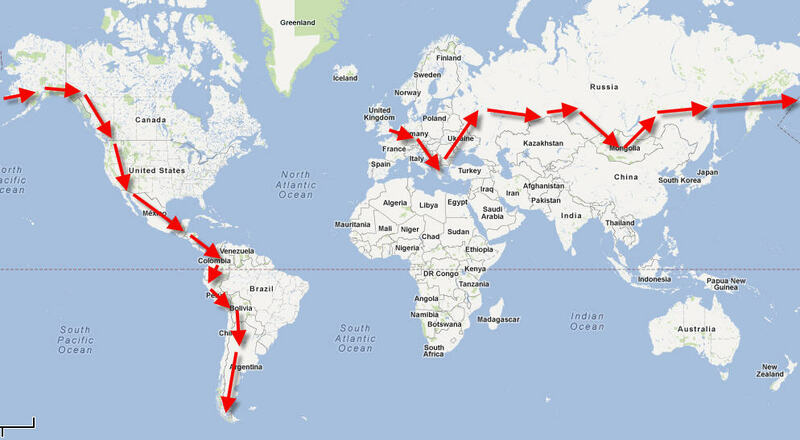 From Vladivostok we plan to cross into South Korea, where we will ship the bikes to the USA and begin the second part of our journey from Alaska to Argentina. The final destination being Ushuaia, commonly regarded as the southernmost city in the world. We will not have an extensive backup crew with medics and fixers, it’s just two guys on two dirt bikes with very little idea of what is about to happen. Thanks Jibba! Really getting excited now. I hope Oz is treating you well. Cheers Boss! Glad to have you on board. Looking through this website has me buzzing! So jealous! I’m really looking to following you guys on this trip! Everyone at Pama wishes you a safe journey, we know you the cardo headsets will do you good, have a good time. Thanks guys. We really can’t thank you enough for your support. We’ll be sure to keep you updated! Hey Peter — It’s Rob with Bill Mayer Saddles. Sent you pics of the saddle build process, but the email is getting returned. Please contact me. Thanks!!! I’ve just emailed. Confirm for me you received it? Just got the word from your dad about your trip(hardly comes close does it?) Have a great time and my best wishes for a safe return. Hi Peter your dad had just emailed me about your trip. All the very best. Enjoy yourselves and stay safe!! Thanks a lot Dave. Really great to hear from you. Wishing you all the best. Woohoo this is Brilliant! Good luck with the last preparations and enjoy the time on the road!! Wish you guys the best of luck with the journey!!! During the Canada leg of your trip if you end up anywhere close to edmonton feel free to send me a msg if possible, and I will help in any way I can if you need anything. Will post a link on the local adventure / dual sport sites to help get the word out about your trip. Best of luck on the trip lads! Looking forward to seeing updates! Wow! serious ride, best of luck on your journey, take lots of pics and ride safe. I’m sure we will see some great post in the DRZ forum at Thumper Talk. this is Mike from Novosibirsk. Have a good ride! Found this site when looking for a safari tank and proceeded to enjoy the reading for the rest of the morning (at work.) Thank you for doing this. Donation on the way. What’s the route through Oregon? Let me know if you need shop space to service in Portland Oregon. Thanks so much for such an awesome offer. We’re in Whistler at the moment. It’s incredible. There is a very strong possibility that we will be coming back to Seattle on the way back down so we may well take you up on your offer. We’ll be in touch closer to the time! Whistler is Awesome! I love snowboarding in the winter and mtn biking in the summer up there- If you dudes decide to come back through Seattle hit me up! Don’t get eatin by any bears up there! Do some wheelies! Hey Ben! Thanks for getting in touch. How far did you make it that day in the end? We crossed the border today and make it to a place called Tok. There is a chance we may stop in Whitehorse on the way back down in which case we will drop you a line to see if we can meet for a quick beer. Hey guys just been told about your trip! Think it’s fantastic if I’d of known sooner I’d of been keen to of joined you both! I own a drz400sm I did a carb mod but yours has fcr carbs anyways have you found your chains are wearing out mine wears at about 6-9 k I wish you all the very best don’t forget to check ya oil as it can get low quick and change it every 2-3 k min! When your back maybe we can arrange a meet with all DRZ riders at ace cafe London! If you need any help For anything from uk pls do contact me I’ll be more than happy to help support a cancer cause! You should be both proud! Thanks for getting in touch. Although our blogs are a little behind, we’re actually already in Colombia. We’ve covered over 20,000 miles. It’s been awesome. We’ve been through 3 chains already but we cut it pretty fine on the second one to be honest. A meet at the Ace cafe sounds awesome! A ot of riders have contacted us through this website so maybe it’s something we can help organise! Keep in touch and we’ll meet on our return. como andas capo !! soy sebastian lupo de argentina ayer 17/01 estubimos juntos en palermo en un boliche llamado ARAOZ ! te deseo lo mejor en este viaje ! gracias Simon! Fue bueno encontrarse con ti en el club. Buenos Aires es un lugar increíble. Tienes suerte de vivir aquí.